I have, for a while now, loved the production quality behind the Electric Valentine duo. I discovered them probably about 3 or so years ago when the electro-pop scene was just getting popular. Now, I decided to take a look back at EV, and see what they’ve been up to lately. Business as usual, making sick, well produced tracks. “Everyone You Know Is On Drugs” was a great track already, full of great production quality and a singer who can ACTUALLY sing…then Kids On Drugs decided to take the track and throw some fat bass lines in there and remix the hell out of it into a banger dubstep remix that was fit for the main stage…and it works. What I love about Electric Valentine is their actual musical talent. I first got wind of them 3 years ago in 2008, when they released their first electro-pop banger, “A Night With You“, and it was SICK. 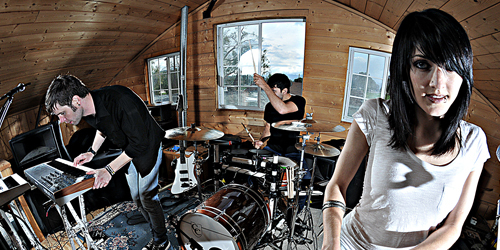 Now, they are still up to their same quality music making more electro-pop tunes! But what is really great about this remix is the fact that Kids On Drugs got a hold of it and spiced it up to a dubstep banger that will have you dancing for days! Crank it!